Last week I reviewed some of the skill position players that the Ravens met with during their time at the NFL Scouting Combine in Indianapolis. Here is a look at the big fellas. The offensive linemen and defensive players the Ravens interviewed as well. Rather than mock drafts, you can get a good measure of which players the Ravens may target come May based on who they have decided to go out of their way to meet with. The Ravens have made it a point that the running game and offensive line needs an overhaul. With a deal not yet complete for Eugene Monroe, it’s possible that the Ravens could have openings at both tackle positions should they let Oher walk as well. Lewan, Martin, and Kouandjio are three guys that have been mentioned quite a bit as first round targets. Taylor Lewan appears to be the perfect fit for the zone blocking scheme Gary Kubiak will install. He impressed at the combine, and may not be on the board at #17. Zack Martin played both tackle and guard at Notre Dame. Versatile guys always peak the Ravens interests. However, Martin is thought to be a Pro Bowl guard, but just a good tackle. Drafting Martin could be an exercise in planning ahead with Marshal Yanda and Kelechi Osemele under contract for just two more years. Martin can play tackle and make the switch in 2016 if either of those two guards can’t be retained. 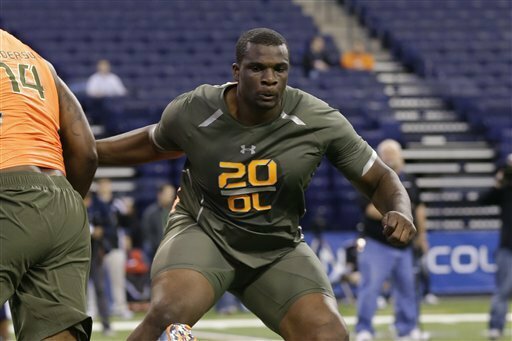 Cyrus Kouandjio, a local kid who played his prep ball at Dematha, could be around later in the first round if the Ravens chose to trade down. We all know how much Ozzie Newsome loves Alabama guys. That leaves Morgan Moses from Virginia. A guy we haven’t heard much about. 6’6”, 325lbs. Moses improved his stock at the Senior Bowl by opening up wide rushing lanes and using his long arms to provide reliable pass protection. He was projected as a second round prospect, but his Senior Bowl may make him a late first round pick now. He exhibits impressive burst for his size when asked to fire through to the second level. His weaknesses are the inability to get low enough to snap into smaller opponents at the second level and a tendency to over pursue. Scouts compare him to Ryan Clady of the Denver Broncos. That is quite the compliment. Pass rushers aren’t the biggest need on the Ravens defense, but always good to have. After Suggs and Dumervil, the depth chart is a little shaky. We’re not sure if Upshaw can regain his rookie year form, Pernell McPhee had battled injuries, and last year’s rookie, John Simon, hasn’t seen enough of the field to know. Michael Sam probably made the most headlines entering the combine. But from a football standpoint, he’s turned out an average performance since being named SEC’s defensive player of the year. Sam has great power and moves to keep blockers hands away from his chest, and the quickness to slip gaps and make plays in the back field. He lacks ideal length so he struggles to shed blocks once he’s engaged. He does compare to a guy like Elvis Dumervil. He’s more powerful than his frame suggests. Jeremiah Attaochu was the pass rushing standout of the Senior Bowl. He finds creative ways to get to pocket. He’s got quick hands that rip at the ball as it arrives in coverage. He is said to have a great work ethic and high football IQ. He was a first team All-ACC player racking up 12 sacks. He appeared to be a fish out of water when asked to be the strong side LB in a 4-3 alignment. 3-4 suits him better as he can be a stand-up OLB, or hand in the dirt as a DE. Attaochu is projected as a 3rd rounder. Dee Ford is projected as a late first round pick, and the third best DE prospect. I can’t see the Ravens going this route, this early, with the other holes that need addressing first. Adrian Hubbard is another Alabama product to keep an eye on. He leaves Tuscaloosa a year early and scouts are impressed with his length at 6’6”. But they are not impressed that he weighs in at just 255 without much mass on that frame. He can do a lot, pass rush, run stop, often drops into coverage, but doesn’t do one thing extraordinarily well which is why he is projected as a 4th rounder. Scouts belive coming out early was a poor decision on Hubbard’s part. The middle of the Ravens defense is also a bit of an anomaly right now as Daryl Smith remains unsigned, and Jameel McClain has been released. Assuming they retain Josh Bynes, it’s he and second year player, Arthur Brown manning the middle. Borland could end up being the steal of the draft for the taking somewhere in the third round. Borland has drawn comparisons to Zach Thomas and recently Luke Kuechly. He’s seen his stock drop as he “looks” smaller than advertised and has the shortest arms of the LBs measured. But if you can play football, you can play football. His high football IQ allows him to consistently dissect the action, rarely getting fooled. He shows impressive pop and determination to get to the ball. His weaknesses include his size and speed getting sideline to sideline. But in the Ravens 3-4 scheme that isn’t a major problem. The long and short on Lamin Barrow is that he is a better athlete than a football player. A raw talent that would need some coaching up. He was LSU’s leading tackler last season. Not sure that’s the type of guy I would want quarterbacking an NFL defense. He’s slotted as a fifth round talent. Hageman is one of this year’s physical freaks. 6’6”, 310 lbs, and nearly ran a sub 5.0 40 yard dash. (5.02), benchd 225lbs 32 times, and possess a 35.5 inch vertical jump. He moves very easily for a big man and was team captain for Minnesota. He’s still raw as a pass rusher and is dead in the water once double teamed. He’s projected as a late first rounder which again, isn’t the hole the Ravens need to fill this early in the draft. Interesting that one guy the Ravens didn’t meet with was C.J. Mosley. The top ILB prospect, most mocks have him falling to around the Ravens selection at #17 in the first round, and he’s from Alabama. You can read more about Mosley in BSL’s own Matt Jergensen’s report. Considering the number of talented WRs and OTs the team met with in Indy, it appears pretty obvious which direction they want to go in round one. Also interesting to note that the Ravens didn’t meet with any safeties, or centers.